Country style ribs come from the blade end of the pork, near the shoulder. Unlike other types of ribs, such as baby back ribs, they contain no bones, but are quite meaty. 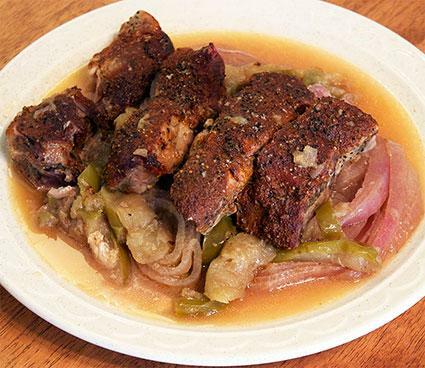 Because of the amount of fat and the type of meat they contain, country style ribs are well suited to the low and slow method involved in cooking with a slow cooker. The beauty of cooking country style ribs in the slow cooker is that the moist heat in the slow cooker renders the ribs tender. By adding just a few seasonings or extra ingredients, you have a delicious main dish that is ready to go at dinner time. Apples and fennel pair perfectly with pork. This savory dish serves six. In a small bowl, combine the thyme, rosemary, garlic powder, smoked paprika, brown sugar, salt, pepper, and cayenne until well blended. Rub the mixture on the pork ribs and set the ribs aside. Put the fennel, onion, apple, and apple cider vinegar in the cooker pot and stir to combine. Put the spice rubbed rib meat on top of the vegetables. Cover the cooker and set it on low. Cook for eight to nine hours, until pork is tender. You can also cook this on high for four to five hours. You can double or even triple this recipe for larger slow cookers or to feed more people. The dish makes the perfect potluck meal, because it can rest set on warm for several hours if needed. The recipe can also be halved for smaller slow cookers or fewer servings. You can vary this recipe in several ways. Replace the apple cider vinegar with bourbon. Instead of making the rub, season the pork ribs with salt and pepper and then top it with one cup of orange chipotle barbecue sauce or basic barbecue sauce. Replace the apples and fennel with three sliced carrots and two sliced parsnips. Serve the ribs over steamed white rice or alongside mashed potatoes. You can also serve with a side of baked beans and some coleslaw. These ribs are very simple, but they make a delicious meal. By using your slow cooker, you're giving the ribs the exact cooking conditions they need to really be able to shine.